HOULTON — Now that the U.S. Department of Interior Secretary Ryan Zinke has put his stamp of approval on the Katahdin Woods and Waters National Monument new business and tourism opportunities will be presenting themselves and Southern Aroostook is positioning itself to cash in. With that in mind, officials with the Aroostook Partnership (AP) and Southern Aroostook Development Corporation (SADC) held a workshop with Monument manager Tim Hudson and Lucas St. Clair, President of the Friends of Katahdin Woods and Waters. About 40 municipal, private industry and economic development officials attended the luncheon to learn about possible opportunities and share ideas on how we could collaborate on tourism to benefit the County as well as the new monument. St. Clair, whose family foundation donated the monument land and provided a $40-million endowment, said Houlton is in a great position to be a gateway to the monument. “Houlton is a prime location to receive the tourists from Atlantic Canada and provide them with services before they reach the north end of the park, which is just south of Patten,” said St. Clair. He added that there will be opportunities, but people need to be cautious and find the right fit for the region. Monument officials are undertaking a three-year planning process to determine where and what will be part of the park, but even though it is still new people are visiting. Hudson said more than 10,000 visitors have entered the monument as of the beginning of Sept.
Hudson said some contracts, like road grading have been awarded, and additional prospects will be forthcoming. He urged business people in attendance to contact Maine Procurement Technical Assistance Center (PTAC) counselor Dana Delano about contracting with the government. Representatives of Aroostook County Tourism (ACT) were also in attendance. Pat Sutherland who chairs the ACT board, described the value of tourism to Aroostook’s economy and said the monument could also bring people to Aroostook County. She said it is highly likely that folks visiting Katahdin Woods and Waters may want to continue their vacation by heading north and it is imperative for the monument and ACT to work collaboratively when possible. Photo top: Lucas St. Clair addresses the attendees at the recent National Monument meeting in Houlton. Aroostook Partnership President and CEO Bob Dorsey addresses the crowd at the most recent business/teacher social in Fort Kent. FORT KENT — A new school year means a new round of Aroostook Partnership business teacher socials around The County. 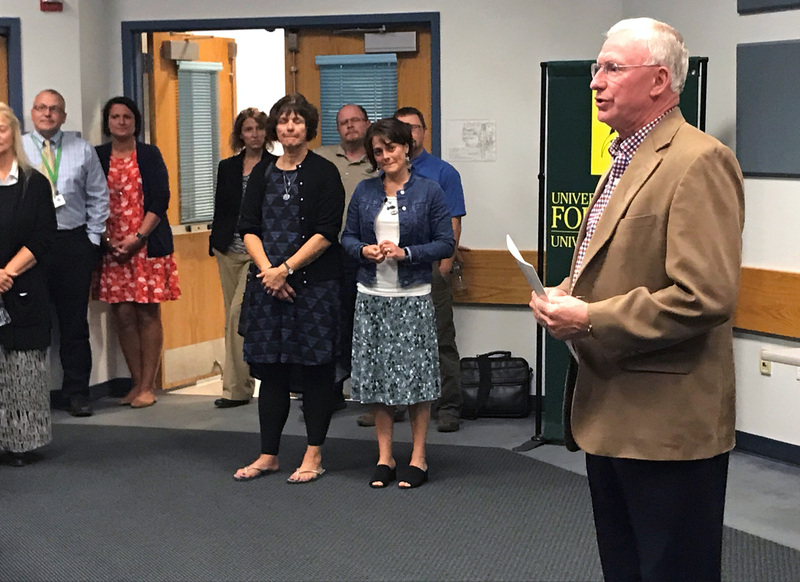 About 40 educators and business leaders gathered Wednesday, Sept. 14 at the University of Maine at Fort Kent to discuss job opportunities in the region, skills needed and incentives for students to work in Aroostook. This social was also the first to include college officials, as well as high school teachers and administrators. Aroostook Partnership President and CEO Bob Dorsey said the idea for the socials came from the “Education to Industry” working group as they look for ways to increase County career awareness. Among the businesses represented were JD Irving, Fish River Rural Health, Northern Maine Medical Center, MMG Insurance, Daigle Oil Company and Acadia Federal Credit Union. “This effort is a continuation of a broader campaign to increase County business and employment awareness to ultimately increase retention efforts to secure our future workforce,” said Dorsey. The most recent social was held in Presque Isle in March. The Partnership has also held socials in Houlton, Fort Fairfield and Madawaska. The Partnership has been compiling data on jobs, turnover rates and economic trends, which are displayed as well as provided to educators and guidance counselors at these socials. Speakers also stressed the need for continued education, whether a two or four-year degree, or even certificate program, emphasizing that continuous learning starting with some form of training beyond a high school diploma is essential. The next business teacher social is set for Thursday, Oct. 26 at 4 p.m. at the University of Maine at Presque Isle. In addition to college staff, Central Aroostook, Washburn, Easton, Presque Isle and Ashland educators are invited. Pattern Energy from California is the latest business to invest in the Aroostook Partnership. 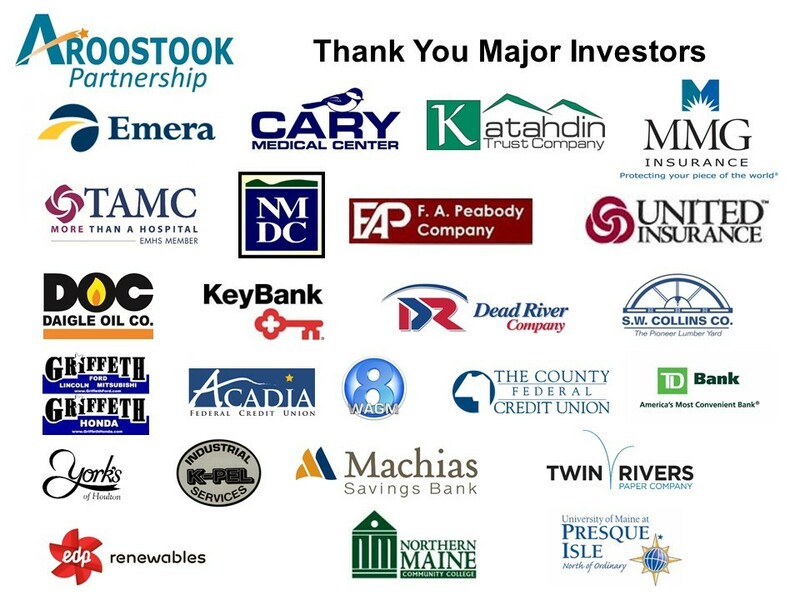 Pattern Energy has a portfolio of 20 wind power facilities, including the proposed King Pine wind development in Southern Aroostook, with a total owned interest of 2,736 MW in the United States, Canada and Chile that use proven, best-in-class technology. The San Francisco-based wind energy investors reached a deal with the now-bankrupt SunEdison to buy development rights for what would be the Maine’s single-largest wind farm. For more information on Pattern, visit patternenergy.com.